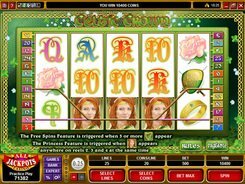 This five-reel 50-payline slot developed by Microgaming takes you to a plant producing golden coins, golden ingots and other golden valuables. 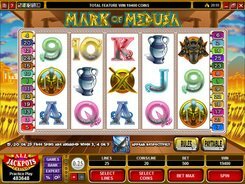 The rich imagery is designed in a cartoon-like manner, and the spectacular symbols include submarines, cars, piles of golden coins, trains, etc. 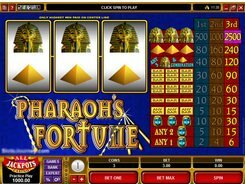 The game accepts up to 20 coins per line, and you can configure a coin size from $0.01 to $0.1, which translates into the maximum bet of $100 per spin. 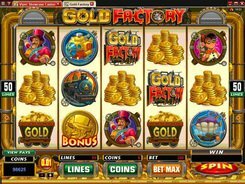 Gold Factory features wilds, scatters, free spins and a multi-tier bonus game triggered by three or more scatters. 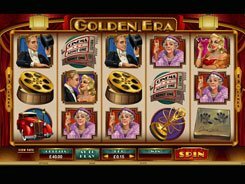 The top jackpot reaches 6000 coins for Golden Coin scatter symbols if five of them display anywhere on the reels. In the Boiler Room bonus game activated by 3+ scatters you are presented with 12 hoppers. 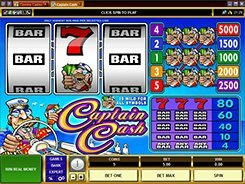 Your task is to pick four of them, each revealing an instant cash prize or 10 to 35 free spins. Then you progress either to the free spins round or to the Reactor Bonus packed with generous awards. 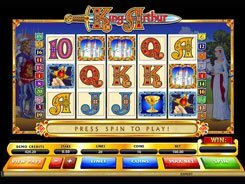 In conclusion, Gold Factory has vibrant graphics, eye-catching animations and a good suite of bonus features guaranteeing an excellent gameplay.